As seen in the section on "Portrait Painting Under Elizabeth and Catherine," eighteenth-century portraiture in Russia reflected an understanding of society dominant at the time: men and women were seen first as types (as members of a class) and only secondarily as individuals. Much changed with the portraits of Orest Kiprensky. The sentiment was now directed towards a particular person as one individual with special psychological responsibilities to society and to himself. Orest Kiprensky (1782-1836) was born the illegitimate son of a nobleman and was brought up as a serf. When his talent was acknowledged at an early age, he was sent to the Academy of Arts. Though trained as a history painter at the St. Petersburg Academy, Kiprensky eventually focused on portraiture. His unconventional self-portraits are remarkable illustrations of the growing awareness of self that characterized the Romantic movement. This is evidenced in his portrait of Colonel Yefgraf Davidov (1809). His portrait of the poet Alexander Pushkin is one of his best known works. The mixed ingredients of early Romanticism, the classical reference of the statue in the background, the plaid sash in the style of Byron, together create a combination of real and ideal found in Pushkin's poetry. The way the subject has his head turned and his expression are romantic assertions of individual personality. Karl Briullov (1799-1852) was one of the most celebrated artists of his day and the first Russian painter to enjoy an international reputation. He had been born in Italy, and came to Russia with his father--a sculptor named Briullo whose last name was Russified to Briullov. By 1823 the son Briullov completed his education at the Academy and went to Rome. There he got the idea for a picture of the destruction of Pompeii in the eruption of Mount Vesuvius. In preparing this monumental canvas, a process that took three years (1830-33), Briullov insisted on historical accuracy. He visited the ruins of the ancient city (which was being excavated at the time he conceived the painting), studied artifacts of everyday life at the Naples Museum, and read Pliny the Younger's account of the eruption of Vesuvius. 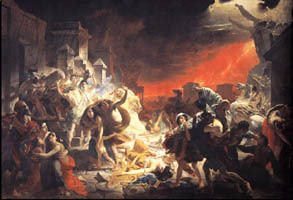 When "The Last Day of Pompeii" (1830-33) was finished, the Italian press hailed it as a masterpiece and Briullov became famous. Public enthusiasm is easy to understand, as Briullov offered something for every taste: he gave a melodramatic treatment of a classical subject with a wealth of realistic detail. With its ambitious, multi-figured scene and dramatic action, the painting changes the course of Russian history painting, inspiring others to attempt similarly complex compositions. When he returned to Russia in 1841 Briullov was hailed as the greatest master of the day and was expected to repeat or even surpass his first work. He never did produce anything on this scale, but created many portraits. In the seated portrait of Prince Golitsyn (1838-40) Briullov recreated not only the man, but also his surroundings. The trellis with growing plants, repeated in the distant room, is evidence of the subject's feeling for nature. Note, too, the distribution of light throughout the space of the room. Many Russians excelled in the tradition of painting interiors. Alexander Ivanov (1806-58). It could be argued that Alexander Ivanov, son of the history painter Andrei Ivanov, was the most significant Russian artist of the second quarter of the nineteenth century, although he spent most of his life in Italy. His philosophical insight, Romantic-Realist style, and innovative studies characterize the directions of Russian art in the nineteenth century. Uniquely gifted and trained to fulfill his potential, Ivanov lived in the city of his birth, St. Petersburg, until his departure for Italy. He studied initially with his father, a professor at the St. Petersburg's Academy of Arts, and became an official student at the Academy in 1817. In 1830 the artist moved to Rome with support from the Society for the Encouragement of Artists. While he devoted much of his time to copying the works of the Italian masters, he also created his own compositions. He focused on Old and New Testament subjects since they offered the psychological complexity that fired his imagination and tested his facility as a realist. "The Appearance of Christ to Mary Magdalene after the Resurrection" was conceived by the artist as a test of his abilities to execute an even more ambitious multi-figure composition. The depiction of complex emotion in the kneeling figure of the Magdalene particularly captured the attention of viewers. Ivanov was obsessed with the artist's power to express nuances of emotion. While twentieth-century artists and critics perhaps place less emphasis on the expression of emotion, any evaluation of Ivanov's oeuvre must take that aspect of his work into account. 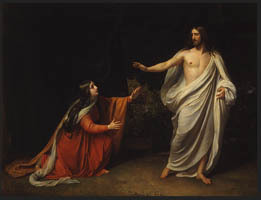 The artist's peers were so impressed by "The Appearance of Christ to Mary Magdalene after the Resurrection" that they awarded him the title of Academician. After 1833, when Briullov's "Last Day of Pompeii" created such a sensation, Ivanov began to consider doing a similarly large work. A deeply religious man, Ivanov was taken with the subject of the first appearance of Jesus to the people announced by John the Baptist. Ivanov chose the episode because he felt it embraced the religious, historical, and philosophical ideas with which he was most concerned: the spiritual and moral transformation of mankind. 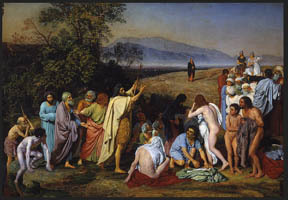 "The Appearance of Christ to the People" (1836-1855) combines a number of separate events in the Gospel: the preaching of John and his baptism of the people in the foreground and the coming of Christ in the distance. Ivanov intended for his painting to surpass in spiritual profundity and natural truth all previous religious painting in the West. So he undertook the most extensive studies, and consulted every artist whose opinion he respected. The result, of course, was that this work took indefinitely long and that he changed his composition again and again. Ivanov's less than total success is the figure of Jesus, who seems almost insignificant. The artist was true to naturalistic linear perspective, which worked against the depiction of a spiritual experience. Despite the fact that it was never completed, the epic nature of the canvas inspired many Russian painters of the later nineteenth century. During his life, Alexei Venetsianov (1780-1847) was hailed as the "father of Russian genre painting." His keen observation of both the power and subtlety of light and his ability to translate his perceptions into compositions of quiet intensity communicate an almost palpable sympathy for the worthiness and dignity of his subjects. These were almost always rural in nature: rural peasants engaged in or pausing at their tasks. Born into a family of icon painters, Venetsianov taught himself before entering government service as a surveyor-draftsman in 1802. He then took private lessons from Vladimir Borovikovskii, who was a professional soldier of Cossack origin. Although he had not graduated from the Academy, Venetsianov eventually received the title of Academician. This acknowledgment of his talent spurred him to encourage the talents of others from modest backgrounds. In 1815 at the age of 35, the artist retired to an estate in the Tver province near Moscow. There he began his own school, which ran through the 1820s and 30s and enrolled seventy students. Venetsianov claimed nature as the supreme reference and his teaching underscored this idea. "Threshing Floor" (1821 - 1823). Assembled almost as if posed for a 'tableau vivant,' in a dramatically receding barn interior appear nine figures interrupted at their chores. Though certain aspects of the composition may seem artificial, the elements are nonetheless beautifully arranged. The spiritual calm of Venetsianov's works distinguishes them from those of a young contemporary, Pavel Fedotov (1815-1853). Fedotov is known for his ability to portray the heights and depths of human existence. He was born on the outskirts of Moscow and grew up in the busy activity of the provincial capital. He studied at the Academy in St. Petersburg, where he was influenced by the collection of Dutch paintings in the Hermitage. Costume, gesture, and detail fascinated Fedotov. His works reflect the emergence of a new class in Russia, the wealthy urban bourgeoisie whose manners and tastes provided the inspiration and the demand for his paintings. His paintings also demonstrate a new and more critical attitude towards Russian life. Fedotov created his own artistic manifesto in a series of oil paintings (1846-1852) which critique mid-nineteenth-century Russian society by illustrating its grotesque contradictions and defects. Each captures a specific moment in time. "The Major's Betrothal (Visiting a Bride in a Merchant's House)," also known as "How to Correct One's Material Condition by Marrying" (1851) a representative work from that series. Fedotov shows the excitement of a rich merchant's family when a middle-aged and no longer rich nobleman comes to court the daughter. His depiction of a pretty, distraught young girl, her course and overdressed mother, and her bewildered father in his old Russian caftan is a sly criticism of the manners of the rising middle class. 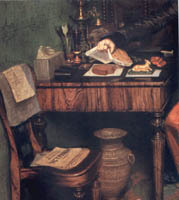 At the same time, his "Nobleman's Breakfast" (1849-1850) shows the material downturn of the Russian nobility. 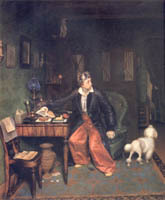 Surrounded by the possessions not yet sold, in the tiny lodgings he shares with his well-trimmed poodle, the aristocrat is eating coarse rye bread for breakfast when a visitor suddenly comes to the door. Ashamed of his meager fare, he jumps up and covers his breakfast with a book. On the chair next to the richly veneered table is an advertisement for costly oysters.